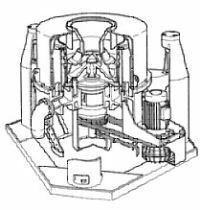 The HEINKEL Vertical De-oiling Centrifuge V 600 - 1100 IS were designed and built for the separation of cutting fluids and coolants from steel, cast and metal chips. 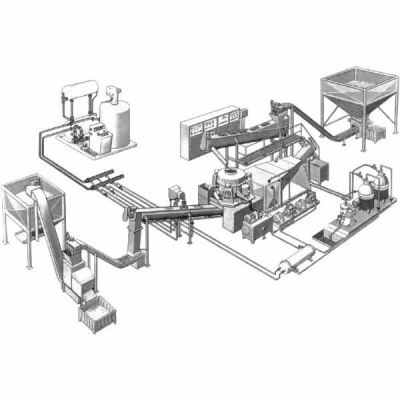 By means of a conveyor device, the chips are filled centrally and as evenly as possible via a stationary feeding hopper into the vertically mounted perforated basket, which rotates with constant speed. The feeding hopper leads into a downward opening distributing cone, which rotates with the basket. Here, the chips are accelerated to the peripheral speed of the basket and, due to the centrifugal force, settle like a homogeneous "debris" in the lower basket section on the basket shell. A hydraulically operated pusher plate pushes the "debris" upwards with a clock frequency of up to 12 strokes per minute for a distance of about 1/4 of the basket height. Even during the up and down movements of the pusher plate, the chips keep flowing continuously and, immediately after the backwards movement of the pusher plate, fill the clearing perforated surface again. 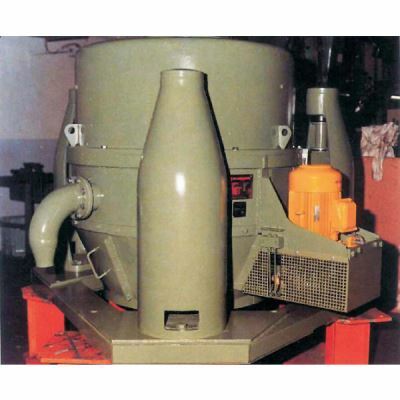 During the batch-like transport and due to the centrifugal force, the adhering fluid is centrifuged from the chips and leaves the perforated basket through a slotted screen and bore-holes in the basket shell. 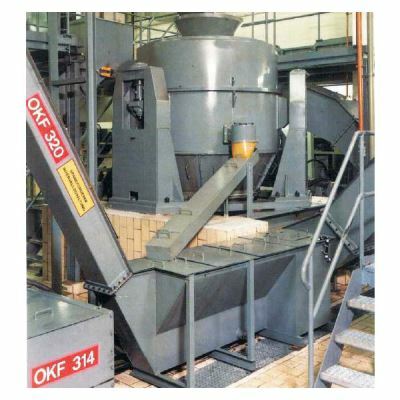 It is collected in the filtrate housing and drained off from there for further processing. The clock frequency of the pusher plate can be freely selected and determines the retention time of the chips in the basket. With a pre-selected centrifugal number, this offers the possibility of optimizing throughput and residual humidity in relation to each other, within the framework of the possibilities allowed by the characteristics of the chips.